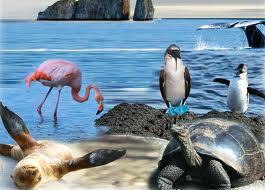 throughout the year, so that you can better plan your Galapagos vacation. Here is a brief profile of major islands & representative species & sub-species of flora & fauna and is not meant to be a complete list nor a guarantee that all species listed will be seen. NORTH SEYMOUR: Swallow-tailed gulls, fur sea lions, blue-footed boobies, yellow warblers, lava (Dusky) gulls, redbilled tropic birds, Galapagos snakes, land iguanas, frigate birds, Palo Santo trees, varied vegetation. HOOD (Espanola) ISLAND: Sea lions, waved albatross (April-December), mockingbirds, marine iguanas, blue-footed boobies, masked boobies, swallow-tailed gulls, pelicans, petrels, finches, lava lizards, Sally light-foot crabs, oystercatchers, blowhole, Galapagos dove. FLOREANA (Charles) ISLAND: Devil's Crown volcanic cone, tropic birds, bluefooted boobies, mangrove region, flamingo lagoon, Audubon's Shearwater, noddy terns, Post Office Bay, coral sand beach. SOUTH PLAZA ISLAND: Sea lions, Darwin finches, Opuntia cacti forest, Sessuvium, swallow-tailed gulls, tropic birds, petrels, land iguanas, lava lizards, Sally light-foot crabs. SANTA CRUZ (Indefatigable) ISLAND: Academy Bay, Charles Darwin Research Station & tortoise breeding pens, Darwin's finches, lava gulls, herons, lava lizards, Puerto Ayora village & curio shops. BARTOLOME ISLAND: Pinnacle Rock, mangrove region, volcanic landscape with spatter cones & lava tubes, swimming beach with some coral development and assorted marine life. ISABELA (Albermarle) ISLAND: Tagus Cove, Cinder volcanoes, penguins, flightless cormorants, noddy terns, crater with salt lake, marine iguanas, pelicans, Audubon Shearwater, blue-footed boobies. FERNANDINA (Narborough) ISLAND: Punta Espinosa, mangrove forest, recent lava flow with different lava formations, hawks, blue-footed boobies, lava lizards, land & marine iguanas, fur seals. JAMES (Santiago) ISLAND: Flycatchers, mockingbirds, yellow warblers, oystercatchers, pelicans, brown noddies, boobies, fur seals, sea lions, seal & sea lion grotto, Sally light-foot crabs, marine iguanas, lava lizards. TOWER (Genovesa) ISLAND: Basaltic lava flow, Opuntia cacti, Palo Santo trees, sea loons, fur seals, marine iguanas, storm petrels, gulls, shearwaters, tropic birds, masked & red-footed boobies, frigate birds. RABIDA (Jervis) ISLAND: Salt water lagoon with flamingos, white-checked pintail ducks, swimming beach with occasional sea lion. 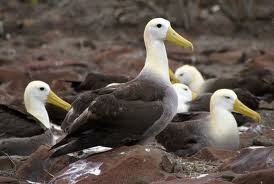 SAN CRISTOBAL ISLAND: Also known as Chatham, is the easternmost island in hte Galapagos and one of the oldest. This is where Darwin first went ashore in 1835. Puerto Baquerizo Moreno, with 4,000 inhabitants, located on the southeast coast, is the Capital of the Province of Galapagos. 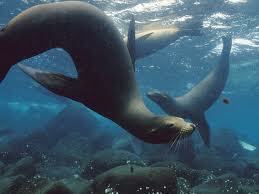 Another small town, El Progreso, is the oldest surviving settlement in the Galapagos, established in 1869. 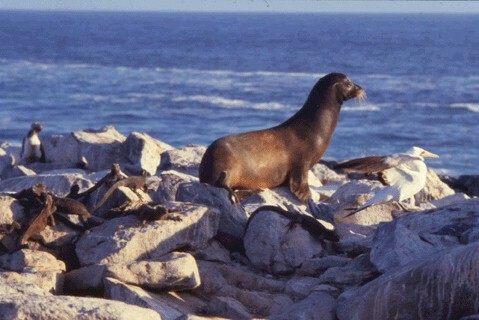 Sites include Kicker Rock, a spectacular rock formation and important nesting site for Tropic Birds, Blue-footed Boobies, Nazca Boobies and Frigate Birds; El Junco Lake in the crater of a volcano and Isla Lobos, a small flat island that is a seasonal nesting location for Blue-footed Boobies and Frigate Birds, although it is named for the sea lions who live there. SAN CRISTOBAL INTERPRETATION CENTER: The Interpretation Center at Puerto Baquerizo Moreno in San Cristobal Island, inaugurated in 1998, consists of various exhibits including human history, natural history and conservation. It is located in a natural setting with the express purpose to enhance the educational experience.